Our new 14 page illustrated instruction booklet provides a complete description of these mechanisms and details several ways they can be mounted. It contains photos and detailed drawings of designs as well as helpful tips for completing projects. 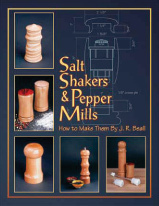 Click the button below to add the Salt Shakers and Peppermills - How to Make Them to your wish list.